What happens at one of Andrew and Dudley's shows? the birthday child will feel like a star! 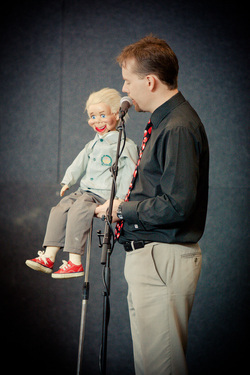 Ventriloquism and magic tap into every child's imagination, and take adults back to a time of wonder and fun. As kids we all had a favourite toy we were sure was alive, deep inside. Andrew's favourite toy brings that dream to life. Andrew is also a professional magician and has some wonderful illusions to add to the fun. These are also a great way to get children involved on stage. Who knows, maybe a future star will be inspired by being a part of the show? As well as a crowd-pleasing birthday show Andrew and Dudley have a range of educational shows which have been shared with audiences of all ages right across Adelaide and even interstate. These include themes of friendship, anti-bullying, a love of reading (great for libraries!) and character development. They are also able to write a script to suit your needs if you have a particular focus at your event. Andrew and Dudley's ventriloquism and magic shows have no real age limit. They are aimed at primary school children but younger children will also get a kick out of Dudley's antics. Parents often come up to Andrew after the show to confess they were just as riveted as their children. Teenagers even enjoy seeing Dudley, and when Andrew was a high school teacher Dudley was known to pop in from time to time to bring some laughs. Their birthday show is best suited to primary school rather than pre-school children. Shows normally run 40 minutes to an hour, but shorter shows are also available if that better suits your needs. As well as unbeatable children's entertainmnet Andrew can also run a variety of workshops for children or adults. Participants can learn magic or ventriloquism and also develop important stage skills for presenting in front of an audience. To make an obligation free booking enquiry please click here to access the contact form.